Following hot on the heels of last week’s Blog I have chosen to write about encouragement, for without it I think many of us would not achieve our goals or even dare to dream big. 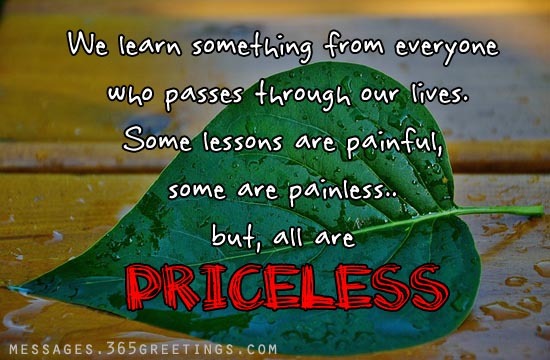 We all need some encouragement in our everyday lives. 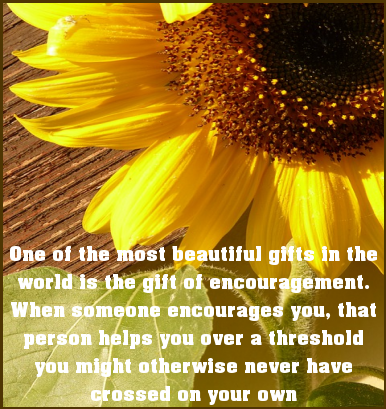 Encouragement is a wonderful gift and, if we are lucky enough, something we will hopefully receive throughout our lives from friends and family. From the time we take our first steps our parents or guardians are offering us encouraging words to reach their outstretched hands and when we do, we feel very pleased with ourselves usually to the accompaniment of much cheering, clapping and praise of how clever we are. Next time you are in the presence of a baby, just watch them when they are learning to take their first few steps and see how happy they are when they reach their destination. Encouragement can come in many forms such as listening to someone’s speech which might strike a chord and becomes the inspiration that spurs us into action. For example, Michelle Obama frequently offers encouragement to young people to complete their education, to travel and to believe in themselves and that they really are good enough and can achieve their dreams. Reading an autobiography of someone who may have struggled during their life but pulled out all the stops to go for what they believed in can also offer us encouragement. Back in 2012, the UK celebrated its most successful Olympics here in London. When the competitors were interviewed later they all said it was the crowd cheering them on that really helped with their performance and to pull out all the stops. As we can see from the above, encouragement is a wonderful way of offering positive support and is an extremely powerful tool in all aspects of our lives. With encouragement comes enthusiasm and once we start to take small baby steps, we become enthusiastic about how many more steps we can take and aware of how far we can go and begin to feel excited. In turn, we begin to feel more energised. Have you ever found yourself in a situation when you have so much energy and enthusiasm that you want to finish something that you’ve started and you find yourself going to bed much later than usual or waking up earlier so you can continue or finish something? This is of course a sign that we are enjoying what are doing. So just by someone’s words of encouragement we not only find ourselves doing something we thought might not be possible but we find we have more life and energy and as a result are much happier. Interestingly, the word encouragement goes straight to the heart. The word itself comes from a combination of the prefix en which means “to put into” and the Latin root cor which means “heart”. Whatever stage we are in our lives, young or old, we all need encouragement, so why not greet someone today with some words of encouragement no matter how small. You never know it might help someone achieve their dreams, make that change or just feel happier that someone noticed them and took the time. I would love to hear from you when you received encouragement at a time when you felt like giving up or when you didn’t think you could do something and the difference the encouragement made to you. I know that I have achieved lots during my lifetime that I would never have dreamed of and it was all thanks to some very special peoples’ encouragement and belief in me, for example I am a qualified homeopath and have also achieved second degree Reiki and am able to practice. So how did you start your day today? Did it begin with throwing the covers over your head and saying “Noooo It’s Monday” or did you embrace the day like any other day? I am always amazed at how many people I hear complaining that it’s Monday and they can’t wait until Friday, usually it is from people traveling on the train, people I meet in the lift, even FB posts that I read from certain friends and yes I’m sure you know who you are. Let’s think about this and let me ask if you are one of the types of people that complain because it’s Monday? If so, does that mean you don’t enjoy the five days from Monday to Friday? If however you are in the camp that treats Monday like any other day then I would imagine, like me, it doesn’t make a difference what day it is. The key is to try and enjoy every day, no matter what day it is. Admittedly the days when we can do as we please are undoubtedly the best but I like to look at the days when my life is restricted as the days that allow or enable me to do all the things that I love to do and enjoy. For example, I have to go to work each Monday, it enables me to have the life I desire and to do the things I enjoy. So when my alarm bell goes off at 6am on a Monday morning, whilst I might not like it, I thank my lucky stars that I actually have a job to go to. I then enter what I like to call the gratitude zone and believe me when we start to be grateful for all we have in our lives the world becomes a much happier and easier place to live in. 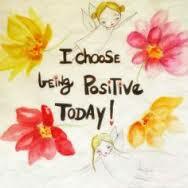 I choose to be happy on a Monday, in fact I choose to be happy and to like every day of the week. Monday’s are the beginning of a new week, fresh and shiny, I like to regard them as Magical Mondays. We can start a new week like we do a new year and set ourselves little goals or targets if we so desire. Also if you are lucky enough to have had a weekend off then the chances are you will be feeling refreshed from having had a weekend doing the things that you enjoy with friends and family. Mondays are also magical because there is the anticipation of the week ahead and the next weekend when we get to do it all over again. I therefore like to treat my Mondays with love and respect. 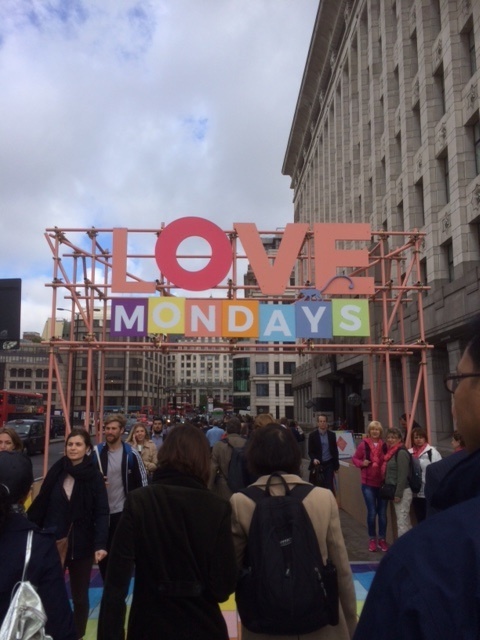 Also a few weeks ago on my way to work and making my way across London Bridge, imagine my surprise when the pavement had been tiled with rainbow colours with the caption at the end of the rainbow “Love Mondays” which is the photo I have used for this week’s Blog. Let Monday’s be your rainbow. If you would like to know more about this project it is called Spark your City and more information can be found at http://www.sparkyourcity.com. It certainly brightened up my commute. I would love to hear from my lovely happy readers something that they enjoy or even look forward to on a Monday and I’m sure if you think hard enough you will discover there is quite a lot to love about Mondays. Wishing all my readers a very Happy Magical Monday and a tremendous week full of opportunity and of course, love and happiness.